In 2004, when the Category 4 hurricane Ivan hit the tiny island nation of Grenada and its 151 mph winds stalled overhead for 15 hours–it devastated the country. But not before pummelling Barbados and other islands, killing at least 15 people. And again last year, the destruction left behind in several Caribbean islands by Hurricanes Irma and Maria once again highlighted the vulnerability of these island countries. “Building the region’s resilience to climate change, natural hazards and environmental changes is not only a necessary and urgent development imperative, but it is also a fundamental requirement to ensure our basic survival as a people,” Grenada’s prime minister Dr. Keith Mitchell told IPS. 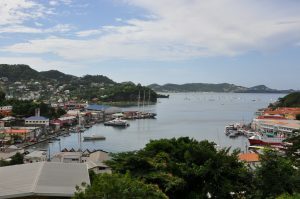 Grenada is among 10 Caribbean countries getting help from the Global Environment Facility (GEF) to address water, land and biodiversity resource management as well as climate change. Under the five-year Integrating Water, Land and Ecosystems Management in Caribbean Small Island Developing States (GEF-IWEco Project), countries are implementing national sub-projects at specific sites in order to enhance livelihood opportunities and socio-economic co-benefits for targeted communities from improved ecosystem services functioning. Project sites include the upper reaches of the Soufriere Watershed in Saint Lucia, the Cedar Grove and Cooks Watershed areas and McKinnons Pond in Antigua, and the Negril Morass in Jamaica. “Adjusting to the new normal requires comprehensive and coordinated efforts to mainstream climate change considerations in development planning,” Mitchell said. In addition to Grenada―Antigua & Barbuda, Barbados, Cuba, Dominican Republic, Jamaica, St. Kitts and Nevis, Saint Lucia, St. Vincent and the Grenadines, and Trinidad and Tobago ―are also participating in the project, which also aims to strengthen policy, legislative and institutional reforms and capacity building. Half of the 10 countries ― Antigua and Barbuda, Grenada, St. Kitts and Nevis, Saint Lucia, and; St. Vincent & the Grenadines ― belong to the sub-regional grouping, the Organisation of Eastern Caribbean States (OECS). Their participation in the project is being funded by the GEF to the tune of USD20 million. IWEco is being co-implemented by United Nations Environment and the U.N. Development Programme and co-executed by U.N. Environment’s Caribbean Regional Coordinating Unit (U.N. Environment CAR RCU), which is the Secretariat to the Convention for the Protection and Development of the Marine Environment of the Wider Caribbean Region (the Cartagena Convention). All OECS countries are signatories to the Cartagena Convention, a comprehensive, umbrella agreement for the protection and development of the marine environment. Fresh and coastal water resources management, sustainable land management and sustainable forest management are all challenges to Caribbean SIDS, and more so as the region’s economies face numerous demands and, inevitably, another hurricane season. Addressing these challenges while improving social and ecological resilience to the impacts of climate change are objectives of the IWEco Project. Stating that storms and hurricanes do not have to result in catastrophic disasters, Mitchell said in too many instances in the region this has been the case because of the prevailing susceptibilities of communities. “We have seen first-hand how poverty and social weaknesses magnify natural disasters. This need not be the case,” he said. Grenada, along with all participating countries, will benefit from regional project activities aimed at strengthening policy, legislative and institutional frameworks, strengthening monitoring and evaluation, and public awareness. At a recent meeting in Montserrat, the regional coordinator of the Cartagena Convention, Dr. Lorna Inniss noted that since the particularly destructive hurricane season of 2017, perhaps even as a consequence of it, the trend in the region towards consolidating several related areas of responsibility into single ministries seems to have grown. Grenada, for instance, now has the combined ministry of climate resilience, the environment, forestry, fisheries, disaster management and information. Dominica now has the ministry of environment, climate resilience, disaster management and urban renewal. The most recent projections in climate research all anticipate a significant increase in the frequency and/or intensity of extreme weather events, as well as slow onset climate-related changes, such as sea-level rise, less rainfall and increased sea surface temperatures. These impacts can disrupt Grenada’s economy and critical economic sectors like agriculture and tourism and damage critical infrastructure and personal property. The findings of a regional study concluded that climate change has the potential to increase the overall cost to local economies by one to three percent of GDP by 2030 in the Caribbean. It also alters the risk profile of the islands by impacting local sea levels, hurricane intensity, precipitation patterns and temperature patterns. According to the Caribbean Catastrophe Risk Insurance Facility (CCRIF), in absolute terms, expected losses may triple between 2010 and 2030. Climate change adaptation is therefore critical for the economic stability of the tri-island state. “Charting a course to 2030 is even more an urgent requirement as the impacts of climate change are increasingly affecting CCRIF’s Caribbean and Central American member countries,” CCRIF CEO, Isaac Anthony said. The post Building the Caribbean’s Climate Resilience to Ensure Basic Survival appeared first on Inter Press Service.